In their Introduction, they highlight that natural forests in dry regions are under increasing pressure from expanding human populations and climate change. Afforestation with fast-growing plantations of exotics have helped to decrease the pressure on natural forests in many countries. However, even plantation forests are under pressure due to scarcity of land for agriculture and development, increasing pest and disease threats, and also climate change. “The increasing demand for renewable resources such as wood fibre is an incentive for industrial forestry companies and private landowners to expand the production of timber outside the traditional forestry areas into drier areas.” Intensified farm forestry and agroforestry has potential to supplement the current supply of forest products and services, especially in the peri-urban areas of developing countries. To improve forest productivity and ensure sustainability, focused research on silviculture and forest management in plantations, woodlots and natural forests in dry regions is urgently needed in many countries. 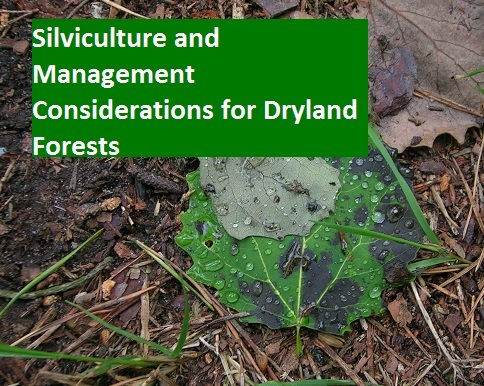 During 2015, IUFRO unit 1.02.05 (Silviculture and management in arid and semi-arid regions) arranged a joint symposium with Stellenbosch University titled ‘Silviculture and Management of Dryland Forests’. The symposium was arranged in seven themes with some key concepts presented on each theme summarised below. Key papers covering most of the main themes were selected for inclusion in these proceedings that form the body of this dedicated edition of Southern Forests. Read the Introduction at no cost until the end of December 2017 here.